Solarski Mechanical Cooling & Heating provides air conditioner repair services in Mercer and Burlington County NJ. Periodically, air conditioner units may break down or experience somewhat routine issues that need correction. Most AC problems have simple and very affordable solutions. Solarski Mechanical offers expert solutions to AC problems at always fair rates. Call us for an $89 service call that includes a 2 year warranty on our repair work! Our small family business will work hard to keep your home's air conditioning running strong with professional repairs and maintenance. Factory trained in residential and commercial air conditioning repair, Solarski Mechanical is committed to keeping our clients cool for less. Exposure to the elements and repeated freeze/thaw cycles can create problems for both the electronic and mechanical components of an air conditioner. No matter what the problem, we'll utilize our expert knowledge, factory training, and decades of experience to fix it in a quick and cost-effective fashion. We strive to achieve 100% customer satisfaction for 100% of our customers. Routine air conditioner maintenance can extend the life of a unit by a matter of years! At Solarski Mechanical, our goal is keep your air conditioner running flawlessly at always fair pricing. Whether your AC system is slowing down, making unusual noises, or has stopped functioning altogether, we'll arrive with our tools and knowledge to honestly diagnose the problem and work up a solution. Then we'll help keep it running for years to come with annual maintenance programs. 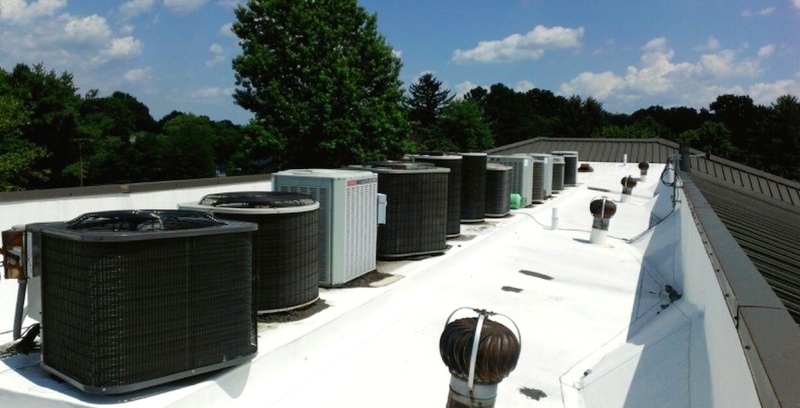 We provide expert air conditioning repair and maintenance services throughout Mercer and Burlington Counties in New Jersey. And because we greatly appreciate our clients, our team is conscientious in cleaning up thoroughly on every job we undertake. Whether you need air conditioning services for a single unit or an entire office building Solarski Mechanical is here to help. We provide speedy, high-quality service you can depend on 24 hours a day. We are an owner operated small business that earns repeat customers through honest work. From AC repairs, to maintenance, to design and installation, Solarski Mechanical has the expertise to professionally service all your air conditioning needs. Check out what our customers are saying about the quality of our AC services. For more information or to schedule an appointment, call us today at (609) 902-1418. We proudly provide the highest quality air conditioning repair to the following towns in Mercer County NJ: Cranbury, East Windsor, Ewing, Hamilton, Hightstown, Hopewell, Lawrenceville, Mercerville, Pennington, Plainsboro, Princeton, Princeton Junction, Robbinsville, Yardville, Trenton, and West Windsor. Residents and businesses in Burlington County NJ can count on us for expert AC repair service in: Bordentown, Beverly, Burlington, Browns Mills, Chesterfield, Cinnaminson, Fieldsboro, Florence, Fort Dix, Marlton, Medford, Moorestown, Mount Laurel, Pemberton, Roebling, and Wrightstown. We repair and maintain all makes and models!